The journey from Alicante airport to Playa Flamenca should take about 40 minutes. At the airport, take the N332 south towards Cartagena. Just now, there is building work happening for the new airport terminal and the route from the car hire place is variable. Last time I was there, we had to skirt round the new building on a track, which did not look very much like the main road, but it took us there okay. 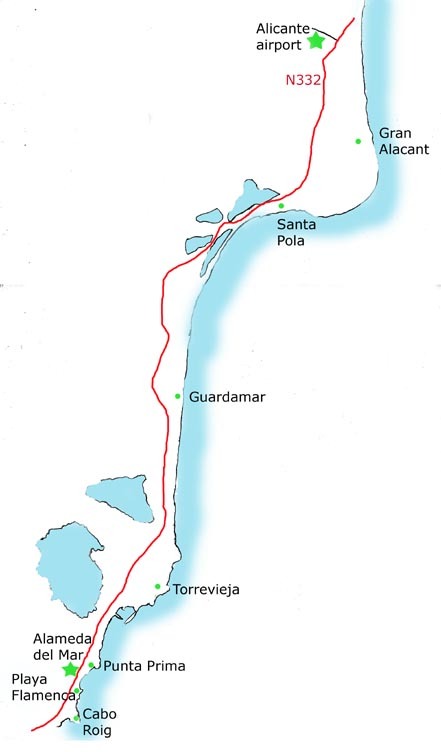 Once on the N332 drive south – you should have the sea on your left hand side.You will see the turn offs for various places – Santa Pola, Guardamar del Segura, La Mata and Torrevieja. After Torrevieja look out for Punta Prima and a blue pedestrian bridge over the road. Along this road there’s loads of shops including Aldi and Carrefour and a Go Kart place. The next roundabout is for Alameda del Mar. Playa Flamenca urbanisation is on both sides of the N332 road just past this. Turn off as required. There is an underpass to the right at the Town Hall. If you come to La Zenia roundabout, you have gone too far. 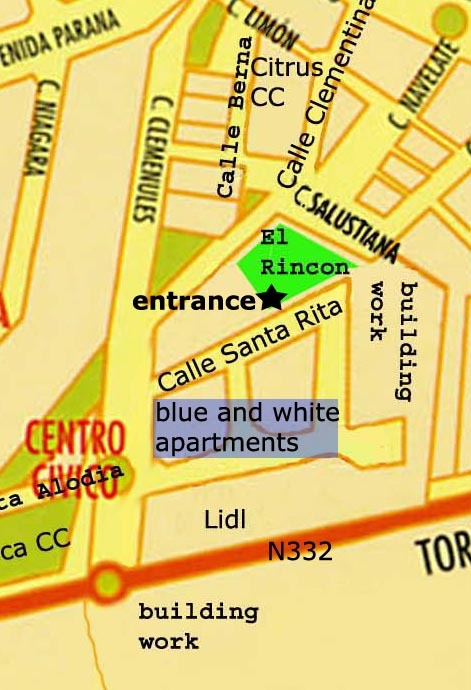 For our apartment El Rincon, Calle Santa Rita, Alameda del Mar you want this roundabout – Alameda del Mar. Lidl is on the right hand side just before the roundabout. Turn right at this roundabout off the N332 and go straight on, on a dual carriageway. Don’t take the road at Lidl, take the next right turn behind the blue and white apartments. 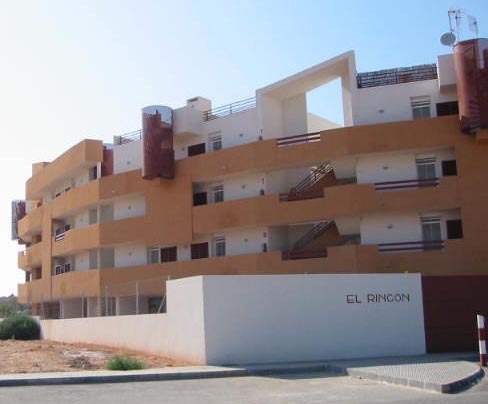 You will be able to see El Rincon – brown and white apartments. This is very straightforward. Drive north on the N332 towards Alicante until you see the airport signs ! Follow the signs. One thing to note – if you have hired a car and are returning it at the airport - the turn for the rental cars is to the left before you realise you are at the airport, so watch out. You can drive round again if you have to, but don’t go into the ordinary car park.